Could US Title Be the Solution for Roman Reigns? Coming into RAW this week, one of the biggest questions on peoples minds was who Roman Reigns would be facing at the biggest part of the Summer on August 21st. It was unthinkable coming out of Battleground that, despite his 30 day suspension for violating the wellness policy, Roman Reigns would be outside the main event picture but here we are. 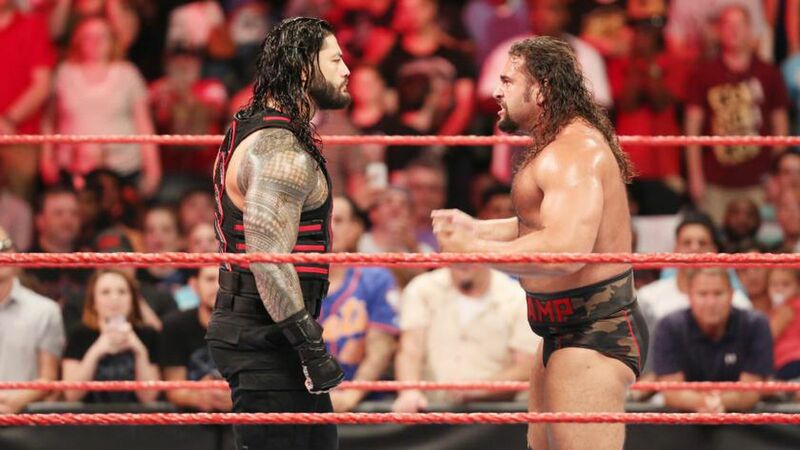 While the match has not been confirmed, it's highly likely that Roman Reigns will be squaring off against Rusev at Summerslam for the United States Championship. Yes, you read that right. Roman Reigns, one of the biggest names in WWE right now, will probably face Rusev at Summerslam for a title that has been on the pre-show for the majority of 2016. So why is this a good thing you ask? Well for my first example, cast your mind back to Wrestlemania 31. John Cena beat none other than Rusev for the US title and went on a lengthy run with the belt. Now, beating Rusev at Wrestlemania aside, having the US title around the waist of a name like John Cena allowed the belt to become more of a prize to hold for everybody. It helped not only the title but Cena himself. With his "US Open Challenge" Cena defended the title against anyone and everyone. In the process he put on some classic matches with the likes of Cesaro and Sami Zayn. Despite losing the belt to Seth Rollins at Summerslam, his run from Wrestlemania helped Cena prove many doubters of his ability wrong. He earned a newfound respect from the WWE universe. This is what Reigns needs. Respect. I'm not saying WWE should copy and paste the whole situation and have Reigns win the title at Summerslam and go on to defend it every week on RAW. People would see right through that and we wouldn't get anywhere. A big problem that Reigns has faced from people is that he has been gifted his position in the company. Many people feel that he bypassed everyone else because he had the look WWE wanted. In a sense this is true. Reigns went straight to fighting the big names while Dean Ambrose languished around the mid-card and Rollins was merely a pawn in The Authority's plans. A run in the mid-card was exactly what Reigns needed to prove his worth to people. If we take a look back in the past, the majority of stars have had runs in the mid-card before becoming main event stars. John Cena had a solid, if unspectacular run with the US title before he ascended to the top of the WWE throne. Stone Cold Steve Austin carried the Intercontinental Championship before transitioning into his famous feud with Vince McMahon but perhaps the greatest example is Roman's cousin, Dwayne "The Rock" Johnson. The Rock started out as Rocky Maivia. A white bread babyface. How did that go down? Well I think we all know the answer to that one. Fans hated him. They hated him more than Reigns, so much that we got "Die, Rocky, Die" chants. So what happened? WWE turned him heel. He insulted the crowd, Thought far too highly of himself and most of all he was Intercontinental champion. He proved to the people that he had what it took. Granted the Intercontinental title meant a lot back then but still, it wasn't the WWF title. The situation we find ourselves in now is the one we should've had at Wrestlemania 31. Instead of Lesnar facing Reigns and Cena facing Rusev, those roles should've been reversed. Reigns would've been allowed to prove to people he was deserving of his spot and Rollins (likely) still have walked out of Wrestlemania as champion. A run with the US title now helps Reigns accomplish a number of things, mainly that he can wrestle. Despite what the audience chanting "You can't wrestle" believe, Roman Reigns can actually wrestle. He has come on massive strides as a singles competitor and while his move set does tend to run the risk of being over-exposed in longer matches, he's one of the safest and best in ring workers WWE have. Putting on matches for the US title against the likes of Rusev, Kevin Owens, Cesaro and Sami Zayn would only benefit Reigns. It also helps make the US title more prestigious because, whatever your view of Reigns is, he's a big name now. The biggest plus for me is that it helps prove that Reigns is indeed mortal. The major issue I've had with Reigns recently isn't his ability, rather the inevitability of the match. His matches against AJ Styles for example. They were excellent but I personally couldn't get fully invested because I knew what the end result was going to be. After losing to Ambrose, Rollins and Balor, I no longer have that feeling and it allows me to appreciate Reigns' ability more. But who knows. Maybe this is all filler. Maybe this is a temporary punishment for Reigns and after Summerslam he'll be in the picture for the newly created WWE Universal title. Whatever happens though, Reigns will give his all and we'll get a great match at Summerslam. TheSportMatrix • We Live For Sport: Could US Title Be the Solution for Roman Reigns?